IKTrix Impulse's advanced inverse kinematics can create a rig move from a camera animated in any way. This camera is animated using a motion path around a keyframed nurbs circle. IKTrix Impulse's advanced inverse kinematics can create moves using both inverse and forward kinematics. 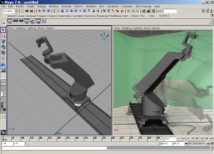 The track axis is animated using forward kinematics while the inverse kinematics algorithm compensates - calculating the axis values required to keep the camera perfectly still.